I'll hope you'll join me today in celebrating the release of Anneka Ever's new contemporary romance, Hearts Race! 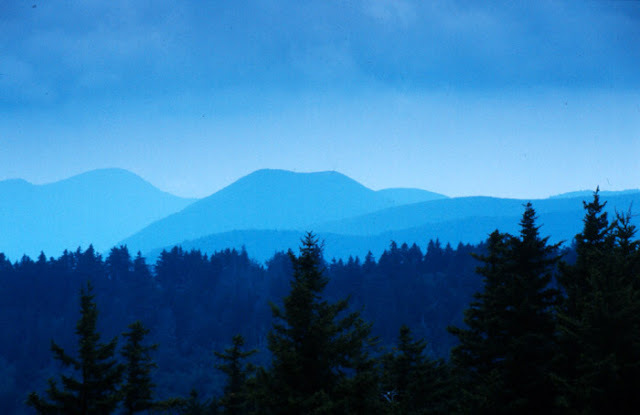 Hearts Race is set in the Blue Ridge Mountains of Virginia, and I don't think this beautiful part of the world gets enough love on the romance front. If this photo of the mountains isn't enough to convince you, then maybe this awesome cover will. Oh my! When it comes to adventure, she’s stop and he’s go. When it comes to romance, he’s yes and she’s no. Can billionaire Dylan Delaney overcome his adrenaline addiction with life coach Greta Larsen’s help before he loses his technology empire? Can she move past the death of her husband to find love again? When Greta finds herself attracted to her very rich, very handsome new client, she sees it as a betrayal of her late husband. Despite her feelings of guilt, she can’t walk away from Dylan, especially when she learns he harbors his own grief. His secret sorrow is the key to Dylan’s love of danger. Greta is determined to unlock his mysterious past so he’ll stop courting death. What she doesn’t count on is the passion she frees. Dylan’s never met a woman who could slow him down. Until now. Greta teaches him to be mindful of the moment, but soon his every moment is filled with thoughts of her. Has he replaced one addiction with another? Hearts Race is the follow-up story to Riverswept and the second book in the Burns Class of Love series. The story returns readers to the small town of Burns, Virginia and also introduces them to the Blue Ridge Mountains around Charlottesville, Virginia. “I want to earn it.” She heard the irritation in her voice. Ben must have too because he peered at her with alarm. She nodded and looked back at the pool. Dylan had climbed out of the water. He wore red swim trunks, modest but not baggy. He ran his hand down his chest and skimmed the water from his skin, dispersing droplets that looked like sunlit diamonds. He had the build of a natural athlete, not overly muscular but firm. When he turned to grab a towel, she saw scars crisscrossing his back, telling the tale of his many mishaps. After he dried off, he padded barefoot to the pavilion and grabbed a bottle of cold water. He looked at Ben who just shrugged and opened his laptop again. Dylan sighed and lifted his head to the ceiling. A fan stirred the air above them. Greta saw goosebumps pop up on his arms and she felt the urge to run her fingertips over his skin. Her fingers twitched. Anneka Ever is a romance author. Her contemporary love stories are set in the mountains and small towns of Virginia. Her strong heroes and independent heroines explore their passion against the beautiful backdrop of rivers, meadows, and forests. She is a member of the Romance Writers of America. Anneka lives in Virginia with her husband and three dogs. You can visit her at www.AnnekaEver.com. (Almost There!) The Long Way Home is Coming Soon!